From kitchen islands to BBQ & fire pits, we've got you covered! A custom-made fire pit can help you get the feel of the great outdoors, without leaving your property. All the ambience of a crackling beachside campfire in the comfort of your own backyard - what more could you want? Our BBQ & fire pits are created to suit your home perfectly, and we work hard to ensure you’re 100% satisfied with the end result. Whether you’re entertaining a group of friends, hosting a family gathering, or just relaxing after a long weekend, a fire pit makes the perfect centerpiece to any outdoor leisure activity. It’s a great reason to gather outside, and serves as an excellent focal point where everyone can come together. It’s the ideal way to add a little bit more character to your backyard, and with our wide range of customizable options you can be sure to get the perfect match for your specific taste. Any centerpiece has to look good and match the surrounding design that serves as its backdrop. That's why we provide custom-made fire pits with designs that can be as unique as your imagination will allow you. With a wide range of paver styles, colors and textures, our team will work with you to draw up a design that perfectly suits your property. We'll take into account all the other elements of your home, such as the driveway, patio and nearby walls, to ensure your property maintains a cohesive, naturally attractive character. Fire can be dangerous if not properly handled. We'll make sure the fire pit is fireproof, to prevent flames from being able to spread, and we'll also incorporate numerous safety systems to prevent burns. In addition to keeping you safe, we'll also keep you comfy; you should feel ready to relax when you’re out by the fire, and our handcrafted designs will certainly give you that feeling. Fire pits are an excellent way to add a little extra character to your home. Don’t settle for less than the best; contact our team at S&P Hardscape Remodeling Los Angeles today and tell us what you're looking for. We'll help you find it, and if it doesn't exist will simply build it. Can I build a fire pit with patio pavers? Yes. It is possible to build a fire pit with patio pavers, as long as you first make sure the pavers in question are safe for fire-related applications, and you take precautions to ensure fire safety around the pit. If the patio has not been built yet, you can first have the pit built and then have the pavers added around it, incorporating the design into one unit. If you choose to add the pit to an existing patio, you must consider the insulation factor very carefully. You can insulate it from the heat that the pit will generate using sand and rock. In this case, cleaning might remove the insulation over time, which will necessitate adding more material occasionally. Alternatively, you can have the pit built on a metal or ceramic enclave, which will provide the insulation and will allow for easy access for cleaning. Can you build a grill surround out of wood? 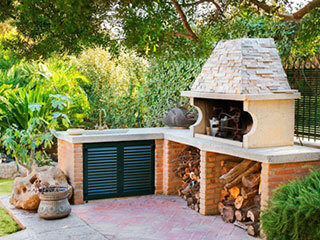 Building a grill or BBQ surrounds, or even an entire outdoor kitchen is becoming very popular. Several advocate the use of wood, new or recycled/reclaimed. But you need to keep in mind that an outdoor grill is not the same as an indoor oven: it will generate a lot of heat often during long periods of time and grease will spread around large surfaces. In addition, the effects of the weather and the open-environment (which can be an open invitation for bugs and other pests) will damage the insulation and eventually render the wood a fire hazard. The solution is simple – invest in a built-for-purpose grill surround, made from a non-combustible material, designed and constructed by professionals like our team. What are some unique cooking fire pit ideas? Fire pits are structures, usually circular, that are designed to contain fire and prevent it from spreading. They are fast becoming a frequent feature, either in addition to the BBQ or instead. A fire pit can be a simple metal ring inserted into the ground and built up with stones or bricks, with or without a metal grate to be used as a cooking surface. It can be turned into a decorative item and even built into the center of a picnic table. You can also use a portable fire pit, such as a chimenea or a fire bowl, which you can connect to a propane canister, and replace the wooden logs with fire glass. Whatever design you choose, remember that a fire pit must be built on a flat space at least 10’ from any structure and engaging a professional will maximize the quality, safety and longevity of the project.